One of the features of the best webhost services is that they make it a point to upgrade their systems and offers from time to time. With this kind of attitude, these companies prove that they keep up with the needs of their clients amidst changing times. Not all web hosting companies have the same view; in fact, many of them remain where they were when they first started, making them incapable of committing to their customers’ long-term needs. Hence, if you are looking for a web hosting service that keeps up with the changing tides by means of constant and committed upgrades and add-ons, then you should check out A2Hosting.com. A2Hosting.com is one of the middle-aged web hosting service providers in the market, having been established back in 2001. Throughout the past decade, this company has proven itself to be reliable in many aspects by means of using new technologies that met its market’s growing needs. At present, A2Hosting.com is among the few hosting providers that offer SSD hosting, a solution only available in the biggest webhosting companies from around the globe. •	Fast hosting via the SwiftServer platform. 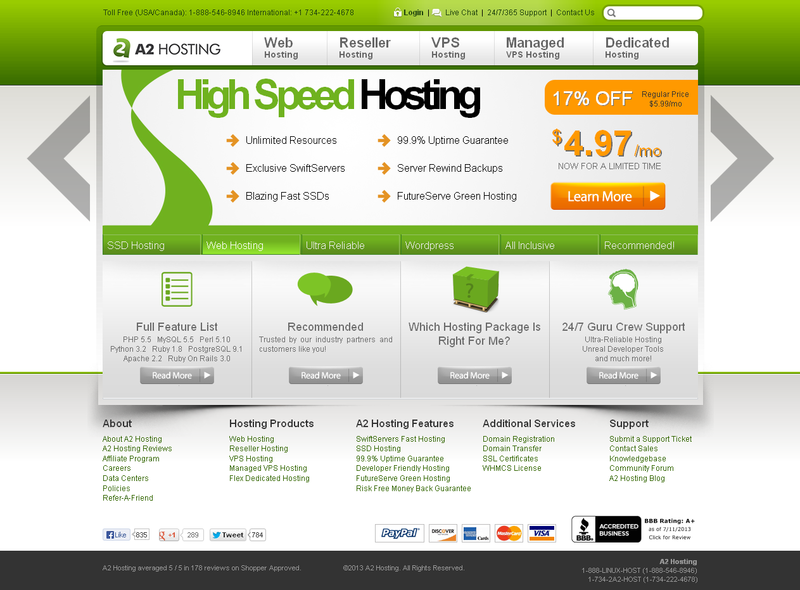 A2Hosting.com is known for its blazing fast IO speed, making it ideal for websites that provide specific services to their clients, and businesses who wish to grow right away. The SwiftServer platform used by the brand uses a solid state drive (SSD) that enables websites to load 300% faster than they were before. •	SSD hosting. All the web hosting solutions of A2Hosting.com run in an SSD, thus allowing websites not only to load faster, but also to stay consistently up all the time. •	Green hosting. A2Hosting.com also offers corporate social responsibility by providing special hosting solutions that entitle customers to have trees planted and named after them in the city of Ann Arbor. •	High speed hosting. This package is ideal for beginners and companies who are working on smaller sites. Its Prime variant starts at $3.92 per month, while the Prime +SSD starts at $7.46 per month. Both plans include unlimited SSD, the use of SwiftServer platform, CloudFlare content delivery network, Railgun Optimizer (extra fee of $2 per month), 2 server location options, 10GB redundant network, 8 core server minimum, and 24GB RAM server minimum. They also contain server rewind backups, HackScan security, ultra-reliable hosting, 1-click WordPress hosting setup, FutureServe green hosting, US-based guru support, and free site transfer. •	Reseller hosting. A2Hosting.com also has reseller options that come in three plans: Deliver at $12.44 per month, Achiever at $20.74 per month, and Endeavor at $33.19 per month. •	VPS hosting. The VPS hosting solution of A2Hosting.com is available via quote request. In this package, users are able to customize their own VPS package; all they have to do is choose the amount of RAM, disk space and data transfer needed, then pay only for the services of the VPS host. •	Managed VPS hosting. This hosting service is the middle ground between a webhosting service and a dedicated server package. It also comes in three packages, the Power+ at $41.49, Prestige+ at $58.09, and the Pinnacle+ at $82.99. •	Dedicated hosting. Dedicated hosting packages are reserved for developers and site owners who want to fully manage their websites on their own. They also offer Flex Dedicated services which give developers control over how their-own server is run. Prices available upon request. There are actually no downsides or drawbacks about using A2Hosting.com, but if there’s one thing users can feel, then that would be the overwhelming functions of the features included in its packages. Even their smallest webhost services have a lot in store, and site owners may not be able to familiarize themselves with the latest technologies and applications right away. Perhaps it would be a good move to use the brand’s web hosting services once the site is starting to expand its reach; this way, clients would be able to use their hosting functions right when needed. A2Hosting.com is known for its outstanding customer support crew, the 24/7 Guru Crew. This crew of talented and well-trained agents knows how to address client issues and their problems with ease; these agents know not only to console clients from their rants to actually providing them with their requests. The Guru Crew is available in all hosting packages, thus giving customers a better way to voice out their complaints, issues and other concerns from time to time. A2Hosting.com is an ideal web hosting package that is most useful for sites made in builders such as WordPress, Joomla, Mantis, Drupal, and Pretashop. This is mainly because its tools were created to cater to such site building platforms, although these can be used on other sites as well. If you are looking for a web host service that comes in different plans and packages based on your needs and services, then this is the brand to get. A2Hosting.com provides a lot of options that you can further examine first, thus you know what to expect once you make a purchase. Lastly, if you’re a site owner who has the tendency to rely on customer support from time to time, then this is the best web hosting service to get. Not only will you be satisfied with the way A2Hosting.com’s Guru Crew handles problems and issues, but as well enjoy outstanding customer treatment too.